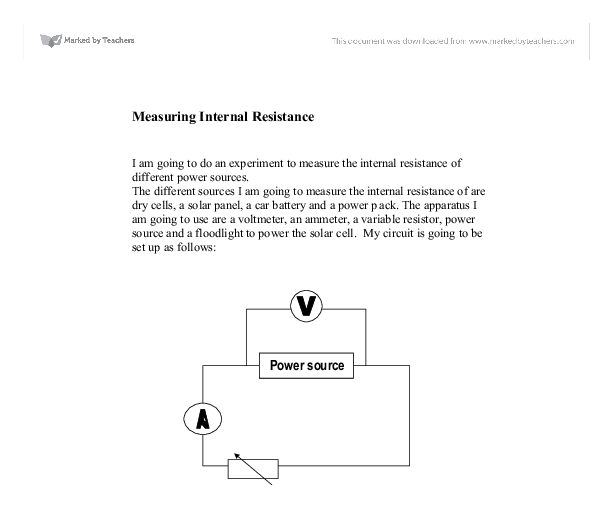 Measuring Internal Resistance I am going to do an experiment to measure the internal resistance of different power sources. The different sources I am going to measure the internal resistance of are dry cells, a solar panel, a car battery and a power pack. The apparatus I am going to use are a voltmeter, an ammeter, a variable resistor, power source and a floodlight to power the solar cell. ...read more. To avoid this happening I am going to keep the resistance quite high. To improve accuracy with the dry cell I am going to use 4 dry cells and take the average, also with all the sources I am going to try and get a wide range of results at least 7 measurements for each. ...read more. I will then draw a best-fit line so that I can work out the internal resistance by calculating the gradient. The gradient shows me the internal resistance because: Lost p.d./current = internal resistance I have shown below how this is true: The line AB represents the lost p.d. and the line BC represents the current. The line AC shows AB/BC, which is the same as the internal resistance. ...read more. As the resistance of the set-up increases, the calculated internal resistance will be greater than expected. To avoid such error, we should check the connecting joints of all the apparatus have no rust. If there is rust, we should another one to replace to enhance the accuracy and the precise of the meters. 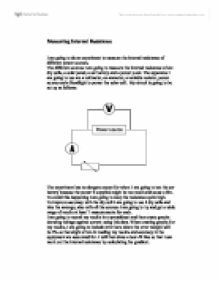 Variables that could affect my experiment: The temperature of the power pack will affect the results obtained. If the power pack were at a low temperature, then its internal resistance would be less compared to a warmer power pack where its internal resistance will be higher. � 30.4 2 170.0 170.2 169.0 3 176.0 190.0 178.2 Modifications The results we obtained were non-precise and irregular, so the graph plotted is not linear. From the graph before it is obvious that there is little correlation and the error uncertainty associated with the results is very large. As the current flowing through the power supply increases, the lost volts will increase. If the current decreases, then the lost volts also decreases until the current is zero. At this point, the potential difference across the terminals of the power supply will be equal to its EMF. It has five voltage settings 2V, 4V, 6V, 9V and 12V. However for my particular power pack there was a fault with the final two voltage settings so it was only possible to take results up until 6V. The power pack also has the option to change current form AC to DC and vice versa. The experiment involves the determination, of the internal resistance of a cell.